Angered students are calling for a graduation make-up, but Georgia State says the most they’ll do is reconsider next year’s ceremony. Georgia State College of Arts and Sciences students, their families and friends gathered at Georgia State Stadium on Thursday, May 10 for the spring commencement ceremony. However, the ceremony was cut short due to inclement weather and now many students are demanding action from the university. The ceremony was scheduled to start at 7 p.m. Shortly before it began, security personnel told the audience to evacuate into the stadium’s interior due to reported lightning in the area. Sophia Marchese, one of the graduating seniors, said that the weather seemed great except for some wind. She said that they had previously been given a piece of paper with instructions on where to sit. When they emerged from what Marchese called “the bunker,” university officials told them to sit wherever they wanted and the ceremony began. “So, the ceremony starts. Music starts playing, and all of sudden President Becker comes out. He gives a two to five minute speech, the same speech he gives every time but it’s fast. It wasn’t right. And all of a sudden he’s like, ‘On behalf of Georgia State, everybody move their tassels from the right to left and now I declare you as graduates,’” Marchese said. She said that Becker told the audience that he apologizes for not being able to recognize each person individually due to the risk. Becker told them that the safety of the students and audience was the priority. “The whole stadium starts booing because everyone realizes right then. They didn’t let us know. We had no idea. They didn’t tell us while we were inside the bunker. We thought we were graduating. We thought we were walking the stage,” Marchese said. She also said people were upset regarding the cost of commencement and that it didn’t seem like the money spent was worth the shortened ceremony. “Everybody paid $50. If you collectively really do the math on that, that’s over $100,000 spent just to walk across the stage, and we didn’t get to do it. Not to mention the hundreds of dollars spent on regalia and the hundreds of thousands of dollars probably spent because our school is so diverse — people were probably coming from all around the world,” Marchese said. According to Marchese, leaving the stadium was hectic and seemed disorganized. “We are getting pushed. Students and families were getting pushed out of the stadium,” she said. Marchese said that the traffic in the parking lot was chaotic as there was no one directing traffic. She said that students started getting out of their cars in order to direct traffic themselves. In the wake of the botched commencement, one student has demanded action from the university. Brooklyn Hart began a petition shortly after the ceremony, calling for the university to hold another commencement ceremony. “I hope that with this petition, [Georgia State] will realize how upset they have made the students and their families. This moment was supposed to be one of the greatest days of our lives and it was ruined by [Georgia State] not having an action plan for situations like this one,” Hart said. Last year’s commencement was held at Georgia Tech’s McCamish Pavilion, a notorious decision that received backlash from students as well. 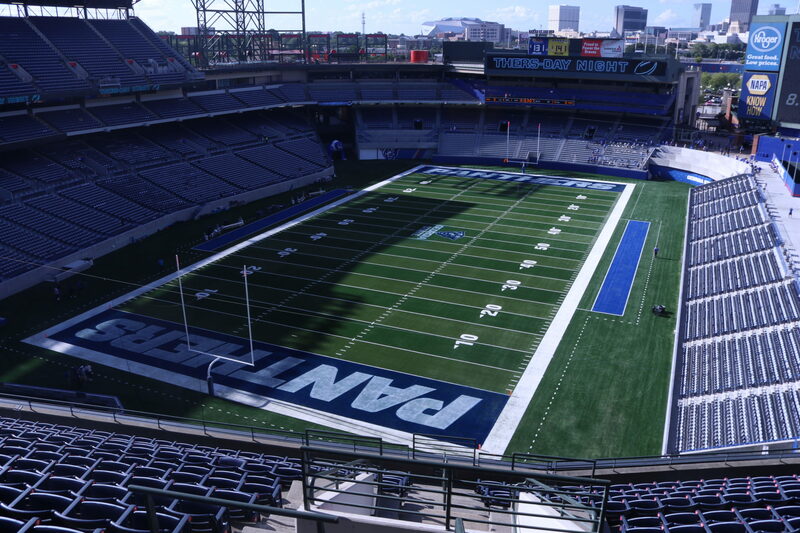 After discussions with the Student Government Association (SGA), the university decided to host the commencement at Georgia State Stadium. Smaller ceremonies, such as the College of Arts and Sciences Master’s commencement, continue to be held at the GSU Sports Arena. In a campus-wide email Friday afternoon, Georgia State University President Mark Becker said he was “very sorry” for having to shorten the ceremony. “We (…) were forced to shorten the ceremony to protect all in attendance from the risk of injury,” the message stated. Becker said that had the university known about the risk of inclement weather by 10 a.m. the morning of the ceremony, they would have rescheduled. “I will revisit the issue of outdoor commencements with the SGA and the University Senate Commencement Committee as we plan for next year,” Becker’s email read.